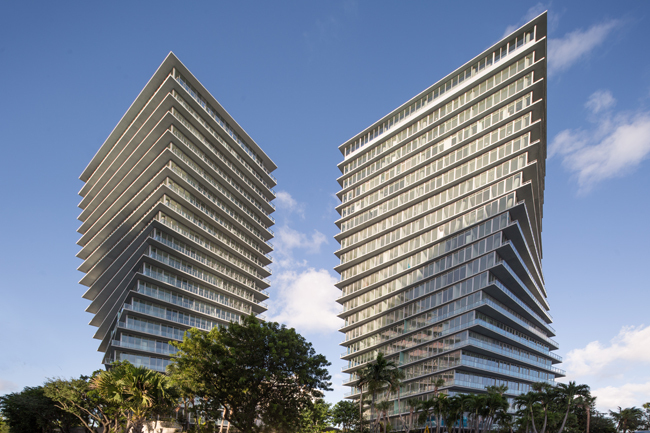 HOW BIG GOT ITS GROVE BACK | "Global Possibilities"
Grove at Grand Bay, designed by Bjarke Ingels Group and developed by Miami based Terra Group, is the newest highrise to hit Miami. 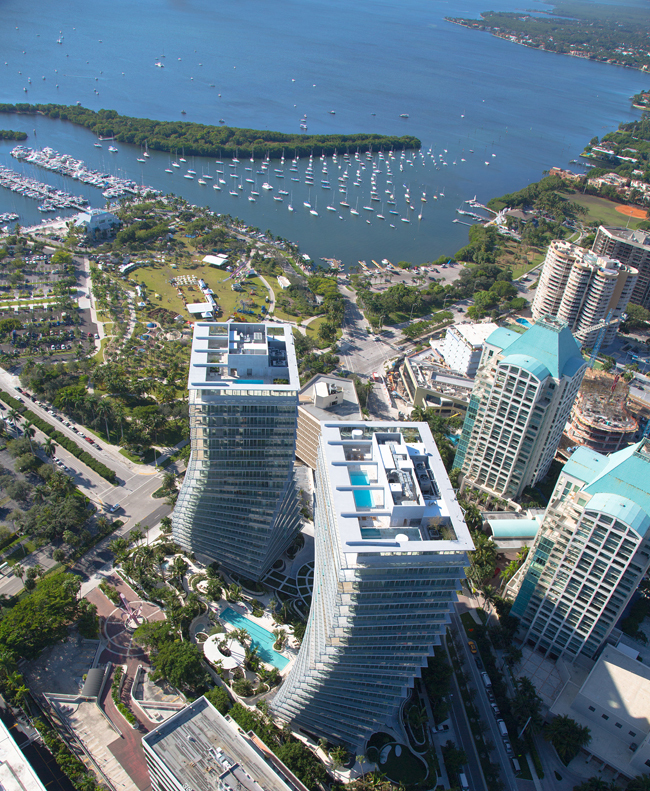 Located just south of South Beach in cozy and historic Coconut Grove, the project, although far from revolutionary, is attractive and contemporary—from the whimsy of the curved massing, to its elegant & structurally sophisticated engineering solutions, to its LEED Gold certification (an important precedent for Miami). But it’s BIG’s collaboration with landscape architect Raymond Jungles—a prolific designer in his own right—that truly brings the philosophy of “re-groving the grove”, Ingel’s supposed intent for the project, to life. 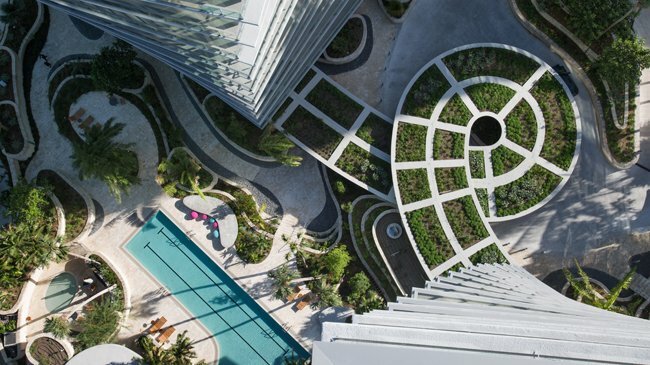 The natural elements surrounding the project integrate it into the landscape perfectly, saving the Grove from becoming what it would otherwise be: yet another vaguely generic luxury high rise in Miami. Luckily for Ingels, Jungles was involved at a very early stage of the project, before demolition. Because of this, the design team was actually able to save the original trees from the site; they were removed for construction and re-planted upon completion. This wasn’t just a sustainable gesture, but a nod to the historic site of Coconut Grove itself. When asked about his favorite part of the building at a recent press conference, Ingels mentioned the porte-cochere that twists and turns, connecting the two buildings, which will soon boast an extravagant display of lush greenery that will literally spill out over the sides to hang and frame the walkway beneath. Then, the gardens will have grown out enough to complete the landscaped environment that he and Jungles anticipated. Besides the green walkway, the rest of the site features native flora, including 460 trees and 15,400 plantings, which lushly fill the three acre site. As always, Jungles’ gardens, through the organization and progression, give a sense of community and connectivity. Grove at Grand Bay brings what they promised, and elegantly “re-groves” the historic and cozy Coconut Bay.